AAA 756 is an Albion Victor PK114 and it dates from 1935, when it was delivered to the King Alfred fleet. It has an Abbott C20C body and is seen outside Winchester Guildhall on 25 April 1993, the running day having been moved to April to mark the anniversary of the operator’s sale to Hants & Dorset. Its fleet number was Victor 6, according to the book on KAMS, but such things don’t seem to have appeared on the vehicles themselves. I know I’m digressing and perhaps it’s just my warped mind – please, don’t all agree! – but Victor 6 seems reminiscent of "Z Cars", though there were only ever two of them, ZV1 and ZV2. I know that one of them was KTJ 578 and the other was (numbers unknown) VTB. I know, too, that KTJ was actually a Leyland Comet chassis which was bodied as the Lancashire Constabulary horse box. I saw it parked in Lancaster on a number of occasions. Any thoughts, please about what VTB was? ZV2 Registration number was 348 VTB, a Ford Consul saloon in the series. Information found on You Tube, hope this will be of use to the experts. Thanks, John & Ian. I had stopped watching by the time the two Essex registrations came into the programme. Both this handsome Albion Victor and the little 1931 Dennis 30cwt, a fraction of which is just visible in the left of the picture, will be in service on King Alfred Running Day on the first of May. 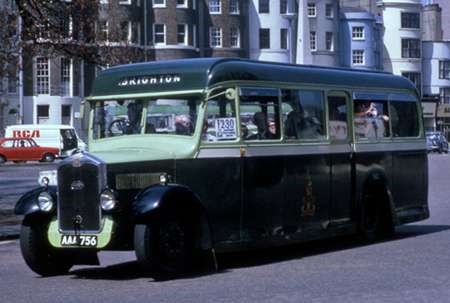 Here is another picture of this Albion taken in Brighton during the May 1970 HCVC run, when it wore a less than accurate version of the King Alfred livery. I believe this vehicle still has its original 65 bhp 3.89 litre four cylinder petrol engine. 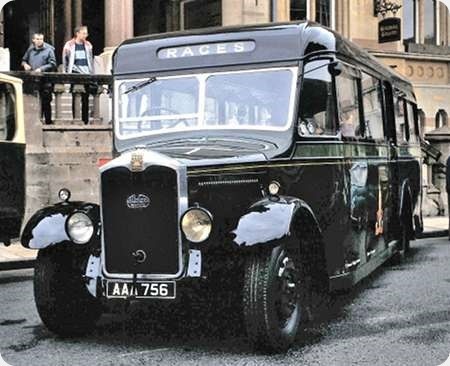 The PK114 was the 17ft 2in wheelbase normal control version which appeared in 1934, four years after the introduction of the Victor model in 1930. Victor production ended in 1939 with the outbreak of war. The Abbott business emerged in 1929 from the failure of the car coach builder, Page & Hunt, at Wrecclesham, just south of Farnham on the Bordon/Petersfield Road. The firm concentrated mainly on car bodywork, but, during the lean 1930s, commercial vehicle coach building and sailplane construction was undertaken also, though these latter activities ended with the advent of WW2. Abbott continued car bodywork manufacture post war, but the diminishing market for this specialised business led to the firm’s closure in 1972. AAA 756 has a curious history. It was bought by Robert Chisnell in 1935 as a coach for special outings, notably to race meetings at Epsom and Ascot, and it continued in service until war broke out, during which conflict it seemingly met with little use. Probably it was lucky to escape being requisitioned by the military. It saw some activity post war until withdrawal in 1949, after which it lurked in the basement of King Alfred’s Chesil Street garage until emerging from its hibernation after private purchase in 1959 by the Rolls brothers. It made several appearances thereafter before a programme of restoration was undertaken by Dave Hurley, by then its owner, in the 1980s. From 1993, now restored and in the correct livery, AAA 756 made many appearances from its base at the Scottish Vintage Bus Museum, until, in 2013, it became part of the FoKAB fleet. Incidentally, I think that the fleet name/number of AAA 756 is Victor 2 rather than Victor 6. Victor 1 was AAA 755, another PK114 of 1935, but fitted with a Duple C20R body. This was withdrawn in 1951. The third and last Victor to enter the King Alfred fleet in came in 1938, but this was a PK115 forward control example equipped with a Strachan C26F body. This one did get requisitioned during the war, and never came back. You are correct, Roger. 756 is listed in the Freeman, Jowitt and Murphy history of the operator as "Victor 2". Now, how did I conjure up "Victor 6"? It can’t be a simple typing error!